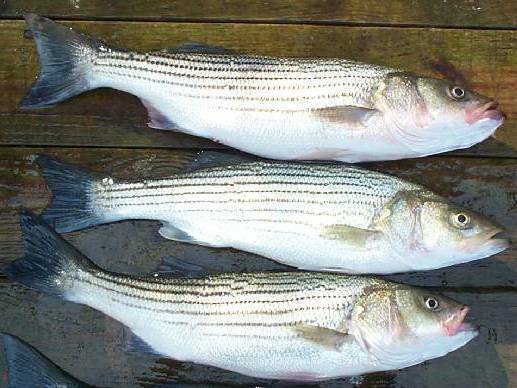 The striped bass is a member of the true bass family, which also includes white bass, yellow bass, and white perch. They are identified by their bronze coloration, lateral stripes, heavy bodies, and large mouth. The native range of striped bass includes the Atlantic coastline of North America from the St. Lawrence River South to the Gulf of Mexico. Several river systems in North America are famous for their springtime striped bass fisheries, including the Hudson, Delaware, Susquehannna, Potomac, James, Rappahannock, Roanoke, Tar, Neuse, Cape Fear, and others. Wild populations of striped bass are anadromous; adults live in saltwater before returning to spawn in coastal rivers and creeks. Although striped bass are normally found in saltwater environments, the species has been introduced successfully in freshwater impoundments throughout much of North America. Freshwater striped bass have gained a strong following among recreational anglers. Striped bass fishing tournaments are popular in some parts of the U.S., with tournament series being devoted exclusively to the species. In freshwater, striped bass feed primarily on baitfish, especially shad and other schooling baitfish. They are often seen in the early morning or late day herding schools of baitfish to the surface. Freshwater striped bass are caught with a variety of techniques, including live bait fishing, casting, trolling, and vertical jigging. Striped bass are also known as stripers. In saltwater, they are sometimes called “rockfish”, especially in the Chesapeake Bay region and surrounding areas. Striped bass regularly hybridize with white bass, the offspring of which are usually called “hybrid striped bass” or “wipers”. Striped bass can be distinguished from the smaller white bass by their larger size and larger number of stripes. Due to their size and table value, striped bass are popular among anglers. They also have a reputation for being effective at controlling populations forage species such as gizzard shad, threadfin shad, and other species.